The first few days back from winter break are not all that different from the nostalgic days of high school. Students discuss their adventures over break and secretly hope their peers are envious. I generally treat break for what it is intended to be. A break both mentally and physically. Being the simpleton that I am, I decided to stay home for the holidays and catch up with family and friends in my hometown of Oconomowoc, Wisconsin (Yes, there are five O’s). It has become a tradition for my family and friends to go to Amalia’s Family Restaurant at least once during break to delight in a delicious breakfast. When eating at Amalia’s, I always go for the eggs. The eggs benedict, with its creamy hollandaise sauce, is in my opinion one of the best choices on the menu. Are eggs not your thing? Pancakes, french toast, and a variety of other breakfast items are available on the menu as well if you arrive before noon. This may seem a little rough to some college students. For those of you that can’t seem to get out of bed, the restaurant does have muffins (as big as your hand!) that are available for purchase at one of the deli windows. Amalia’s has lunch and dinner options as well, including a variety of sandwiches, burgers, salads, and fish. The restaurant itself is generally very busy, but the wait staff keeps up with the pace and provides the best service possible. The one thing I have come to love about eating at Amalia’s is that it is part of the strip mall in Oconomowoc. The restaurant is surrounded by a number of art and coffee shops, in addition to a gelato shop that is located just across the street. I don’t know about you, but after I eat, I treat myself to a dessert regardless of the size. Luckily for me, the gelato shop never fails to satisfy my sweet tooth. If you are up for traveling out to my cute little hometown, come and explore what it has to offer. From the natural beauty to the comforting warmth the community provides, I am sure you will come to love it as much as my family and I do. 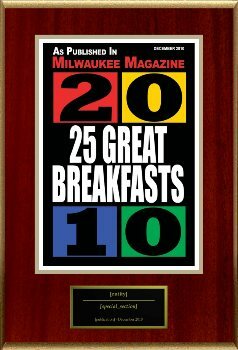 Amalia's was one of 23 other restaurants recognized by Milwaukee Magazine in December 2010. Patrons of Amalia's Family Restaurant and Merton Custard already know they've got tasty fare. But both local restaurants received further vindication when they won first place for their products at 1029.9 THE HOG's fifth annual Sticky Fingers food competition and feast Oct. 24 at the Waukesha County Expo Center. The event invites area culinary experts to bring a large helping of their favorite flavors to enter into four categories: wings, ribs, chili and frozen treats. Then they opened the floodgates to more than 1,2000 hungry participant who purchased tickets for an afternoon of eating and judging what tantalized their taste buds the most. Owners of Amalia's downtown Oconomowoc family restaurant, Theresa and Manuel Perez, spent days before the event preparing more than 35 gallons of chili to be devoured in 1,700 handmade bread bowls Manuel prepared. Theresa said the event was a blast, and Amalia's was a sticky hands-down favorite from those who sampled the chili. She said even the health inspector onsite for the event was impressed. "He said he was so impressed by our setup, he had to come back and try the chili," Theresa said. She was still gushing with excitement over the event the following Thursday, and now that she's been able to rest her arm from stirring gallons of chili and Manuel has been able to recuperate from all his baking, they are thrilled with the results. "It's bad when your arm goes numb; my arm was burning from scooping all the chili, but what an honor, what an honor. It was a great event, and the crowd was great. There were so many people, they filled it to the rafters," she said. 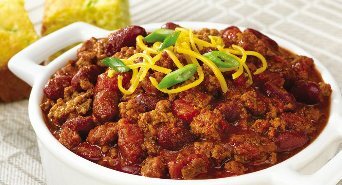 If you missed the competition, you can still taste the award-winning chili that has won similar titles in the Downtown Oconomowoc Merchant's Association's annual Chill-i-Fest, where Theresa said they've placed in the people's choice and judge's award. It's on the menu every day, Theresa said. Merton Custard owner Linda Pawn was happy to bring back the fourth consecutive trophy for first place in the frozen treats category. "It's a very exciting event, and it's fun to do. We love to see people happy; that's why we're in the restaurant business," Pawn said. She said that for the past four years, Merton Custard has won first place; it placed second the first year of the sticky fingers competition. The custard shop brought chocolate, vanilla, butter pecan custard and also offered sundaes. Pawn said they brought about 45 gallons of the frozen treats to cater to the crowd. Pawn said she still gets nervous each year when defending the title, but the excitement makes it fun. Both winners said they saw some familiar faces at the competition. "Probably about 80 percent of the people are regulars. The more you enter, the more popular you become," Pawn said. Theresa Perez agreed, saying she was even flagged down on the street by a man who hollered, "Awesome chili!" "One guy we saw said he eats at Amalia's all the time. Another said they just moved to Oconomowoc and are ready to go" to the restaurant, she said.